We know the text doesn’t call for mint sun tea, but no one should have to live without this recipe. This is one of our go-to drinks for summer. As sort of tea aficionados/addicts, this fills our needs for both tea and sunshine. 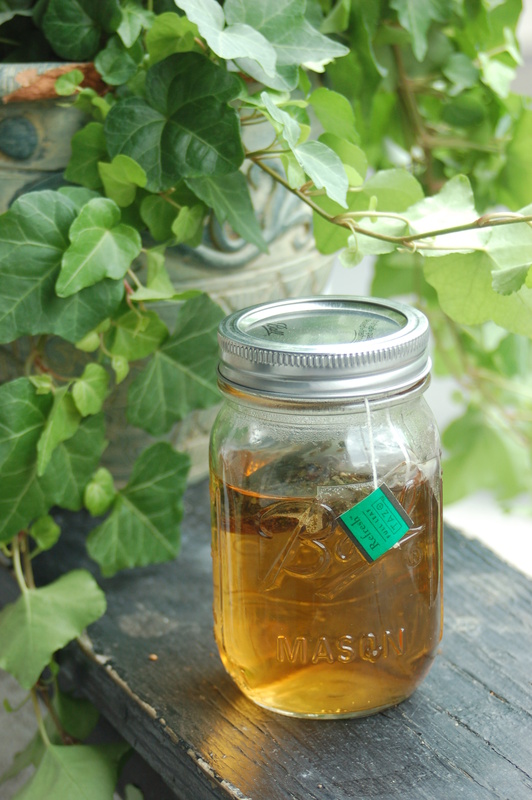 Sun tea is a fantastic way to get your caffeine fix without having to use the kettle on a hot day. If you plan far enough ahead, you won’t have to ever go inside again! Also a great recipe to use when camping. And you always look cooler drinking from a Mason jar! Put all the ingredients in your glass jar and fill with water. Seal the top and place in direct sunlight for about 6 hours. You can adjust the time depending upon how dark you like your tea. When the tea looks too good not to drink, strain or remove the leaves, lemon, and tea bag. The tea can be drunk warm direct from the sun, or on ice. Either way, you’ll want more! You always look cooler when drinking from a Mason Jar, it is known. The water is boiled and the jar sterilized, right? Otherwise, as with sour dough starter, you never know what you might catch and end up with in your tea after 6 hours in the warmth of the sun. Mint is all over my little garden, I make similar tea with hot water and love it. Sometimes I don’t use black tea at all, just mint and some honey. You can cool it with ice cubes – great on a hot humid day. I have an old recipe of face lotion where the ingredients are brewed in the sun for 2 weeks, but vodka is added for sterilization. The sun sure does something to substances, and we undervalue its power. The idea of brewing in the rays of the sun sounds beautiful and romantic, but, unlike our forefathers’, our “modern” bodies are so weak to fight bacteria… Be careful and have a great weekend! Seriously? I’ve never gotten sick from sun tea. Also, most people hand wash or dishwasher their Mason jars. Time to live a little………..
P.S. Also, the water sources in the US (town water) are tested on a regular basis. If you have well water you can use a Brita pitcher first before making tea. If you live somewhere that has scary water you can use any type of filter first (or a whole-house filter if you prefer). If you’re that concerned, buy bottled spring water. And if there are any sort of microbes to worry about here, they are probably from the mint from your garden, so make sure you’ve cleaned that thoroughly. Most kinds of mint are antiseptic, hence more likely to kill bacteria than spawn them. Leah, I agree that we are too scared of bacteria. But this is a reality of the day: we are so much weakened by bad food and air, and other hazards. We are not people we were meant to be – the children of nature. So it’s better to be on the safe side. I drink a lot of Brita filtered water, but never from the tap. Yes, cities test their water, but then they send you a report saying that the water should not be consumed by elderly and children under a certain age. It means they probably found something or just didn’t treat water the right way. So in this wonderful mint tea water should be at least filtered. What I noticed, when you use filtered water in cooking it changes the taste to the better. Especially true with coffee and tea. Frequently, that’s a sodium issue. A germaphobe, hanging out on a website for medievalists. There’s something you don’t see every day. I’m not sure what you mean by ‘weakened by bad food and air’ – I assume this is some sort of alternative medicine belief. However, if anything, our immune systems are weakened by LACK of exposure to pathogens. Our “modern bodies” are absolutely not too weak to fight bacteria – every one of us does it, every day, all the time. Just as our ancestors did when they were ‘children of nature’ who typically lived to the ripe old age of 35. Still, observe a reasonable level of cleanliness in your food prep. Wash out your mason jar, don’t brew tea using ground water from a puddle, rinse your mint leaves, and try to avoid adding raw meat to the brew before you put it out in the sun. Unless you have some sort of underlying immune deficiency, your body will handle the rest. Put 5 tea bags in 1 quart of cold water in a medium sized pot. Remove from heat, steep 3-4 minutes. Remove bags and pour into a pitcher over 1 quart of ice cubes. Stir until the cubes are melted. A sure sign of a ruined batch (although you CAN have a ruined/contaminated batch and not see sign) is an “off” scent, or “threads” dangling down inside the liquid. Those are bacteria strands. Dump the tea, wash and STERILIZE that container before reusing. Oregano, also mint family, could be used instead of mint. Oregano flowers make a fabulous more intense tea. Oregano has antimicrobial and antiseptic properties, especially the oil of oregano, it was used since ancient times. Once I seeded oregano in my little garden, now it’s allover the place and grows like a weed. Cannot wait for it to bloom. These blooms are also good in salads. Down here in the south, tea is a staple. Sun tea can be had in a mere 2 or three hours during the high heat of summer, and it’s a wonderful way to take the edge off a stifling hot day! thanks for this recipe, can’t wait to try it!